The season of Easter is once again upon us. This Easter has a very special meaning for me because it will be the last time that I will celebrate this season with you as your pastor. The time is coming when I will no longer be able to take part in the life of the Congregational Church of Putnam. As I reflect upon some of the changes that are coming, there are a few things that we need to know about the process of my retiring and your finding a replacement to fill the pulpit that are important. I have recently read the book “Saying Goodbye” by Edward A. White. The book compares the process of “Saying Goodbye” to that of the grieving process. There are 5 stages of grief: denial, anger, bargaining, depression and acceptance. Unfortunately, for both of us, this process is either happening or going to happen. I have already felt that I have been in the midst of grieving in some of my daily activities of “ministry” that have been on my plate in the recent few weeks and months since announcing my retirement on June 16th. Knowing that I will no longer be able to be there for someone in need, or performing a sacrament of the church, or counseling someone in need, has already made me stop and think about “who will I be when I am no longer the pastor of PCC”? And it also begs the question “who is the Congregational Church of Putnam” after I retire? I know that in the remaining time that I have left, you will have many questions about what I can and cannot do after June 16th. Basically, I am not allowed to perform or participate in weddings, baptism’s, funeral’s or any form of public worship. The reason for this isn’t because I no longer have standing as an ordained minister, it is because both you (the church) and I need to distance ourselves from one another to allow the grieving process to take place. This does NOT mean that if we should happen to see each other somewhere outside of church that we need to avoid each other, in fact, I hope that will NEVER happen. I look forward to seeing each one of you in the days and years ahead. This time of separation is to allow for the new seed (interim or settled pastor or both) to begin to grow and blossom into the new relationship that will lead you for the foreseeable future. I truly believe that God already knows who my replacement will be, and through the work of the Holy Spirit and the Church Council and Search Committee everything will fall into place, just as God has planned. Once a new pastor has been settled, it is my sincere hope and desire to return to PCC and participate as a member, but that cannot happen until that time. The season of Easter is the most important time in the life of the church, and I know that as we move forward together, there will be a glorious resurrection and a new beginning to celebrate. Happy Easter to each and everyone, and I ask you to continue to pray for our work together in the name of Jesus the Christ or risen Lord. Spring-- a time for rebirth, new beginnings, and new growth. In researching and preparing for this article I was reflecting on God's promises of how we can always depend on the continual rebirth of the earth through the charges of the seasons and the rising of the sun and moon each and every day from the beginning of time. The earth certainly has changed and is continuing to change, but we can alway count on God to keep His promises. Lent-- a season of preparation and anticipation of what is to come. It is a 40 day process, and we cannot rush it to get to the end. Yes, we are eager to get there and experience the joy and excitement of the Easter Resurrection; however, we must go through Lent and the stages of change that leads us to a new place of new growth, rebirth, and new beginnings. So, also, in comparison is the process that we as a church are going through at this time. It is a time of great change for us, a time of new beginning, and a time of rebirth for our church. We are going through a time of preparation and anticipation of what is to come. We must go through this process, and we can not rush through it either. Change is hard, we can choose to fight it or we can choose to accept it, but it will happen no matter how we choose to handle it. Change happens in stages; it is a time to reflect on where we have been, where we are now, and where we want to be in the future. Change can divide us or it can bring us together. Change is growth and growth that fails to lead to changes in our behavior is not healthy. Growth that brings us together and leads to a new understanding and fellowship increases our ability to do the work that God has called us to do. The council also is working through this process as we are are preparing for our new interim minister and the formation of a search committee. The reception committee has been formed and is working on Pastor Tom's reception. It is to be held on May 19th at the Thompson Speedway. You will receive more information soon; but please mark your calendars and plan to be there in support of Pastor Tom and Bunnie as they venture into this process of preparation and anticipation of new changes in their lives. We pray for them and for the church as they and we move forward toward their final deadline of June 16th. It will be very hard to see them go and to cut ties with them as a church, as our spiritual leader, our confidant, and especially as our friend. We will certainly pray for them and hope to see them again as members in our congregation. As I said many times, change is hard, but we will pull together in support of one another; and with prayer and God's help we will grow through this experience and come out stronger in the end. Those present: Sharon Almstrom, Tori Bates, Skip Bates, Kat Dunton, Greg Biggs, Gerry Gagne, Jo-Anne Joslin, Audrey Lombardi, Pastor Tom, Barry Shead, Jim Zahansky. Pastor Tom opened the meeting with a prayer. Tori made a motion to accept the January 8 meeting notes, Skip 2nd the motion. Tori made a motion to accept the Financial report and Greg 2nd the motion. The Board has been doing well. Everyone has been great taking part of church services. Skip will be doing the children’s message on February 24th. Trustees: Quiet month – Working on -Parking lot lights – Handicap parking space – Bob Egan Special meeting to ask the church for the funds. Christian Ed: Still going strong. Safe Church Policy, Greg is good to go will send draft to Audrey. Haven’t heard from Putnam Police dept. yet. Interim profile was filled out. Thank you for the gifts and filling in while he was away on their trip. Next meeting will be held on Tuesday, March 12, 2019. The motion was made to adjourn at 8:02 pm by Greg, and 2nd by Gerry. Motion made to accept report by Tori Bates, 2nd by Louise Pempek, all in favor, so moved. It was a very cold, but successful night. just waiting for confirmation from the company. Audrey reported that a signup sheet will be put in the chapel. 2nd by Angela Stringer, all in favor, so moved. Kat reported that everyone brings a bar of candy to play. Kat reported that people will pick up the supplies and directions to do the tie dye at home. There will be 3 buckets with tee shirts (small, medium, large). Kat reported that a lemonade stand will be built, we have a cotton candy machine and face painting will be on the lawn. A donation jar will be set up for donations. Kat has a friend who will teach this workshop. **** Kat will organize all activities on the lawn for first Friday’s . It was reported that spots outside would be 10X20 and spots inside would be 10X10. Venders would bring their own tables, chairs, etc. and clean up after. The possibility of opening the kitchen on Friday and Saturday selling hot dogs, chili (Saturday only). 8. Reminder to leads – you’re responsible for your own advertising- Melissa for Facebook, Deb Thurston for website which are free and Linda at the Putnam Town Crier, etc which needs to be paid for by Faith Fellowship. b. Audrey announced that Westfield CC is hosting a Financial planning event. c. Charlie Leach announced a change in venue for the Golf tournament to Connecticut National. d. Charolette Picard discussed that recycle bins should be in the chapel. e. Audrey Lombardi discussed the need for new table cloths for card tables in the fellowship hall. Next meeting: Sunday March 10th, after church. It has come to my attention recently that several requests have been made to the Sexton to add additional jobs to her already full job discription. Unfortunately she is allotted only so many hours to fulfill the required duties of the job and is unable at this time to take on more jobs that are not her responsibility. If anyone has a one time, or once in a while request, or sees things that may need to be addressed please speak to me as her direct supervisor and we will try to make arrangements. We can be proud of the job she is doing and the way our building is being taken care of. She accomplishes so much more than expected in the small numbers of hours given to her. We appreciate all that she is doing. We are particularly excited about a new element to our sale . 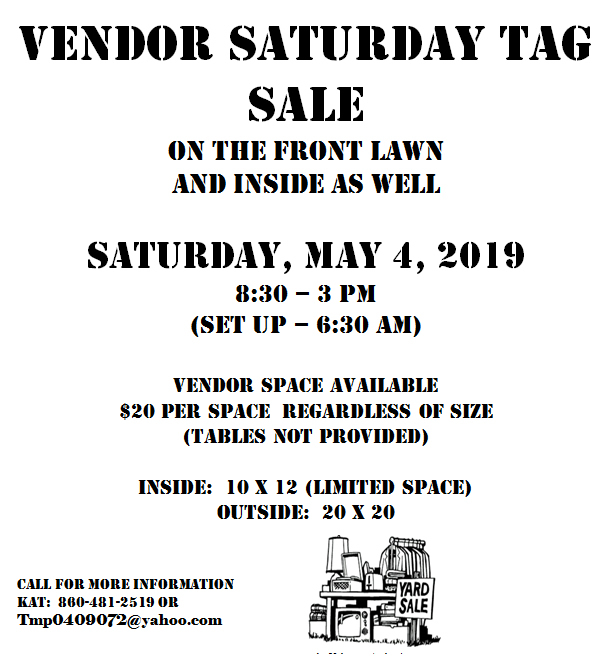 . . On Saturday only, we will sell vendor space to those who might like to set up on our lawn or Chapel Room. Again, this does not apply to Friday night 1st Friday as PBA, of which we are a member, sells vendor space – we needn’t compete with their efforts. Outdoor space will be 20 x 20, Chapel Room space 10 x 12; fee for space regardless of size will be $20 which includes advertising.. Fee does not include tables. Vendor set up begins Sat., 6:30 AM. For more information, contact Kat at 860-481-2519 or Tmp0409072@yahoo.com. For our sale, we will offer the usual sellable items: furniture (no sleeper sofas), décor, jewelry, wall art, linens, antiques, collectibles, books, dishes, electronics, baby items/toys, tools, garden. We do not sell clothing. If you have items that need to be transported our team will arrange and complete the task. All other items may be brought to the church beginning in April. Please note: as of now we have very few items to support a great sale. We are looking for sellable merchandise and have two months to collect it. SET UP WORK HOURS: vital to be ready for the sale. SUNDAY, 4/28 11:30; after church need people who can lift to move merchandise from balcony and basement to dining room or Sunday school room. Need to set up tables and display units. Should take 1 ½ hours. NOTE: we plan to seek H.S. students who need community service hours to help. MONDAY, 4/29 9 –12 noon: empty boxes, sort and clean items, display in appropriate area. TUES., 4/30 9-12 noon: empty boxes, sort and clean items, display in appropriate areas. THURS., 5/2 9-12 noon: same tasks. SATURDAY, 5/4 3 – 4:30; clean up; will pursue H.S. students to assist. Sign up sheets will be in place by April 14th. 4. Consider times you might donate to work the set up and/or selling/cleanup. 5. Promote Saturday Vendor Sale with family and friends. This is a work intensive project but one that is valuable to our Church. Please consider your participation in as many ways as you can. It’s all good when many hands are there to help. It’s now officially Spring and with that comes thoughts of new things and new growth. It is also time to think GOLF. This year will be adding several new elements to our 18th Annual Golf Tournament. Hard to believe that it has been 18 years since we started this tourney and there have been many changes along the way. The biggest change this year is the fact the tournament is to be played at the CT. National Golf Course here in Putnam. The committee met with Jim West, manager of the CT National, several times before deciding to make the switch. Jim has assured us that his course will do the best in assisting us in any this year way possible, thus making the committees job a lot easier. The committee has met several times, and we have mailed out letters to prospective sponsors and golfers. We have also made sure that the applications for our golf scholarships have reached all area high schools. Dates to review the scholarships and to interview candidates have also been set. Two new items which have also been added to our agenda are donations for people who would like to have a sign either in memory of a friend or loved one, and letters to former scholarship winners asking for their support at this year’s event. Both forms and letters have been mailed out or have been made available through the church office (see another Beacon Article). We will still be looking for volunteers to assist in the running of the tourney around the beginning of June. If you are interested in helping, please set aside the date, June 30th starting at 11:30 at CT National Golf Course here in Putnam. On June 30, our Church will once again sponsor the Steve Bousquet Memorial Golf Tournament. This event, held at CT National Golf Course, provides four scholarships to area high school students and also financial support to our Church. After 17 years, our venue has changed to CT National and we hope to enjoy the same great golf. As an additional means of raising money for this project, we are offering our Church members and friends the opportunity to purchase a commemorative sign to be placed for all to see on the golf course. This could be a memorial or a sign of recognition. Each sign would cost $50 with all proceeds credited to our Golf Tournament and shared equally with the Scholarship Fund and our Church General Fund. Thank you for your consideration. For more information, see Charlie or Greg.